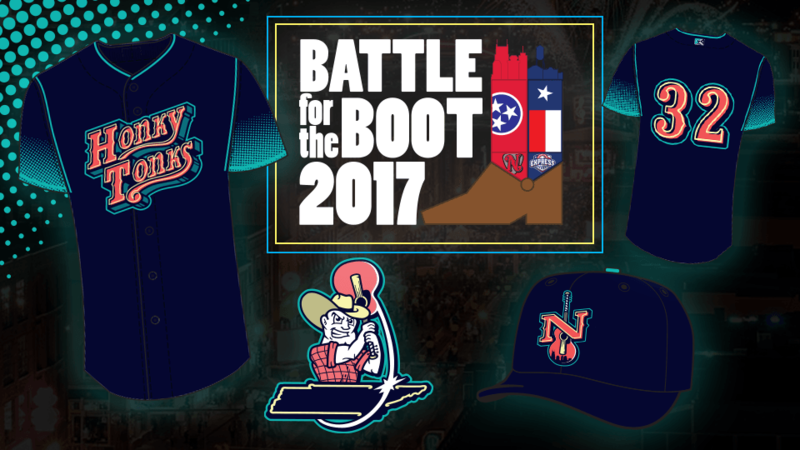 The Nashville Sounds and Round Rock Express have announced a two-game home-and-home series to #BattleForTheBoot during the 2017 season. The series will feature both teams wearing jerseys best representing their respective city. The Nashville Sounds will become the Nashville Honky Tonks and the Round Rock Express will become the Round Rock Dance Halls. "Becoming the Honky Tonks for two nights during the 2017 season is a great way to represent Nashville as the real Music City," said Sounds General Manager Adam Nuse. "The Express won the division in 2015, the Sounds won it 2016, and we're confident the Honky Tonks will win the Battle for the Boot and help us repeat as division champs this year." Game one of the two-game series is scheduled for Thursday, May 5 at Dell Diamond in Round Rock. Game two is scheduled for Thursday, June 29 at First Tennessee Park. Nashville's specialty jerseys feature a navy blue front with neon blue gradient sleeves. Scrolling across the chest is "Honky Tonks" in neon red with electric yellow trim. Included on the sleeve is a man with a cowboy hat and guitar on top of the state of Tennessee. Along with the unique jerseys describing the famous Honky Tonks in Music City, the Sounds will also sport new hats. The navy blue cap features a neon red "N" with a guitar that features the Nashville skyline. The winner of the #BattleForTheBoot trophy will be determined by the play on the field in the two-game series. If a team sweeps the series, they're crowned the winner. If the two teams split the series, a social media vote through Twitter will decide the contest.